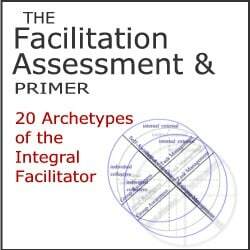 This Assessment Primer introduces a comprehensive model of facilitation and a self-assessment instrument used to rank your skills relative to 20 Archetypes of the Integral Facilitator, and an Action Planning guide to support your growth. When you purchase the Assessment Primer, you are allowed to use it in your training programs and in your organizations to support the development of facilitation competencies in your students and colleagues. Become a member of FacilitatorU.com premium member and receive a host of other items and benefits. An exceptional value. Click here for details.